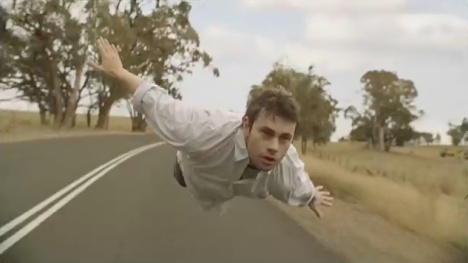 The Flying Honda ad was developed at DraftFCB, Melbourne, by creative director/art director/copywriter Scott Lambert, art directors/copywriters Evan Roberts, Mick Bakos, Matt Garbutt, agency producer Karina Wright. Filming was shot by director Steve Rogers via Revolver Film, Sydney, with director of photography Mandy Walker and Garry Phillips, executive producer Michael Ritchie, producer Georgina Wilson. Editor was Bernard Garry at Bernard Garry at The Editors. Post production was done at Fin Design and Bean Colour. Sound was mixed at Risk Sound by Paul Baxter. Original music was composed by Johnny Green at Nylon Studios and produced by Mark Beckhaus and Karla Henwood.